David Hertz is founder and president of S.E.A. David is a native Angeleno born in 1960 and resides in Venice, California. David Hertz became interested in architecture as an adolescent. And, at an early age, became interested in human habitation and the juncture between the natural and built environment. Serving as an apprentice to artists and working in construction trades gave David a tacit knowledge of construction and fabrication. With combined studies at UCLA, he enrolled at SCI-ARC (The Southern California Institute of Architecture), where there was a real interest in ecological design at the time. While there he obtained a strong foundation in pragmatic environmental design. Before graduating, in 1983, with a Bachelor of Architecture degree from SCI-ARC, David worked in the office of Architect, John Lautner FAIA (formerly an apprentice to Frank Lloyd Wright). After travel and study in Europe, David returned to serve an internship in the office of Frank O. Gehry and Associates FAIA before opening his own firm, Syndesis Inc., in 1984. David Hertz and the work of Syndesis has been widely exhibited and published and has received numerous awards for architectural and materials design work, including the 1990 Progressive Architecture Magazine’s Young Architects Competition, the Architectural League of New York’s Young Architects Competition and Forum, and the 1993 Design Leadership Award sponsored by Inc. Magazine and Corporate Design. Recently, his work was featured in several architectural tours including CABoom, Venice Art Walk, AIA Home Tour, and the Reinvention Conferences. It has been published in architectural publications such as Dwell and Global Architecture. The International Design Awards presented David Hertz with a Gold award for his 747 Wing House in 2012. In 2008, David was elected to the prestigious College of Fellows of The American Institute of Architects as the youngest member in its 152 year history. Many of David Hertz’s furniture pieces are displayed in significant private and museum collections. In May 1995 the Syndecrete® product was included in an exhibition entitled “Mutant Materials in Contemporary Design,” at the Museum of Modern Art in New York and was subsequently acquired as part of the Permanent Design Collection. In 1998 Syndecrete® was exhibited at The Smithsonian Museum of American History in an exhibition entitled “Inventing for the Environment.” Most recently, Syndecrete® and David’s architecture were featured in the exhibit “Liquid Stone” at the National Building Museum in Washington D.C. In 2003, David won an award for Excellence in Concrete from the Oregon Chapter of the American Concrete Institute. Syndesis has won many additional national, state and local awards, including the AIA Service Award for Craftsmanship and the Sunset Magazine and AIA California Western Home Award. David Hertz has been an active participant in the environmental and design communities for over two decades with participation in numerous organizations including service on numerous professional committees such as the L.A. Chapter of the American Institute of Architects Committee on the Environment, the Environmental Affairs Committee of the Construction Specifications Institute, the Environmental Committee of Concrete Organizations, and the California Energy Commission’s High Performance Wall Systems Collaborative. In 2004, he became a LEED Accredited Professional, administered by the U.S. Green Building Council. After selling the Syndecrete® technology in 2006, Syndesis Inc. evolved into the Studio of Environmental Architecture, a Santa Monica based practice devoted to green building. David’s personal involvement includes membership and pro-bono services for many non-profit environmental and social service organizations including Architects, Designers and Planners for Social Responsibility (ADPSR), Business for Social Responsibility (BSR), The Natural Resource Defense Council (NRDC), and Heal the Bay. David has served on the faculty of the SCI-Arc Professional Development Program and the Academic Advisory Committee for UCLA’s Extension Program while teaching sustainable design courses. He also taught a studio focused on prefabrication at the Art Center College of Design in Pasadena, as well as courses at USC School of Architecture on Repurposing. David has received the American Architecture Award in 2012, the 2012 Gold Medal International Design Award, the AIA CAlifornia Residential Design Award for 2010, and was included in the California Design Biennial. His work on the 747 Wing House won an American Architecture Award and was presented at the "City and the World" exhibition at the Istanbul Biennial in Istanbul, Turkey in 2012. In 2014, he was featured in a Los Angeles AIA Monograph Tour devoted to his residential architecture in Venice Beach, California. In 2015, David Hertz was invited by TEDx Venice Beach to give the opening keynote talk on Radical Reuse, and was featured in KCRW's Art Talk episode "Daring & Inspirational Architecture Around the World." 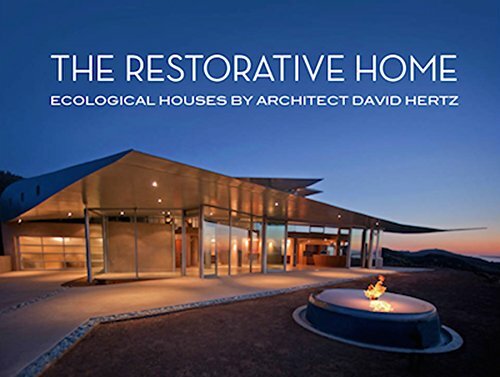 In 2015 an ORO Monograph published The Restorative Home: Ecological Architecture by David Hertz. In 2016 Hertz was featured in "Precipitating Change," a short documentary on his work with atmospheric water generators that make fresh drinking water from moisture in the air was made. The film has been shown at SXSW as well as the Architecture And Design Film Festival in New York. The New York Times has published an article about his renovation of a 1900's Venice Beach house. David has also given talks at the Los Angeles Greenbuild Expo and served as a juror for the X Prize Visioning 2016. Hertz has also founded SkySource to promote the use of atmospheric water generators as a solution to the water crisis, and is serving on the Board of Directors of Heal The Bay.